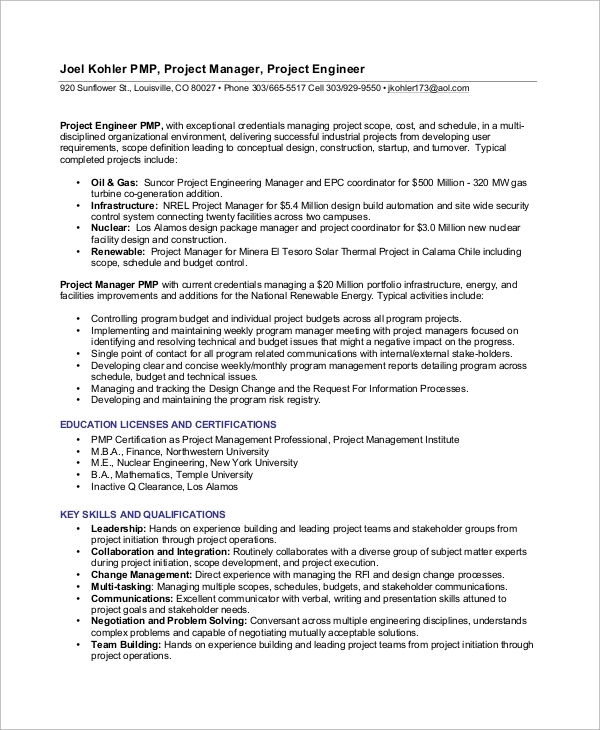 Project manager resumes are very different and unique from that of general resumes because it depends on qualifications, certifications and most importantly work experience. Everything else becomes secondary to them. Therefore, it is of immense importance to make such resumes with proper conviction and follow the perfect standard. 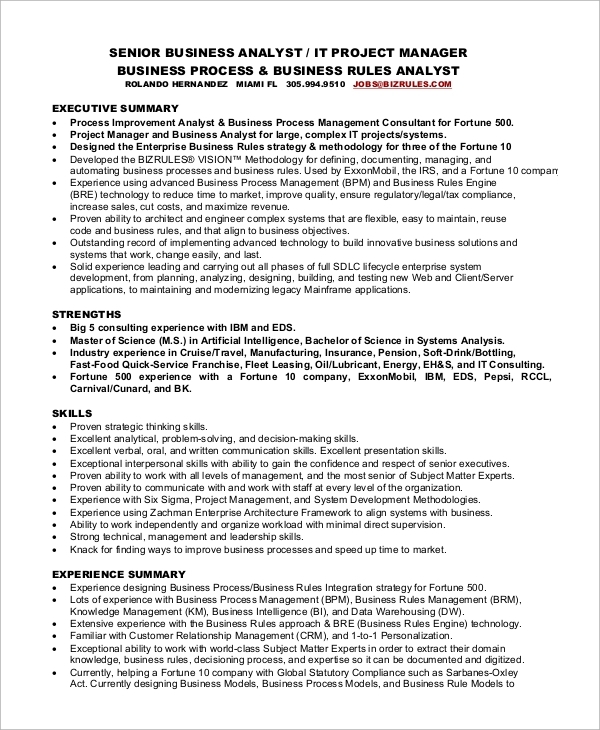 The following project manager Resume Samples are here to serve you with all the ingredients needed to prepare a stunning resume. 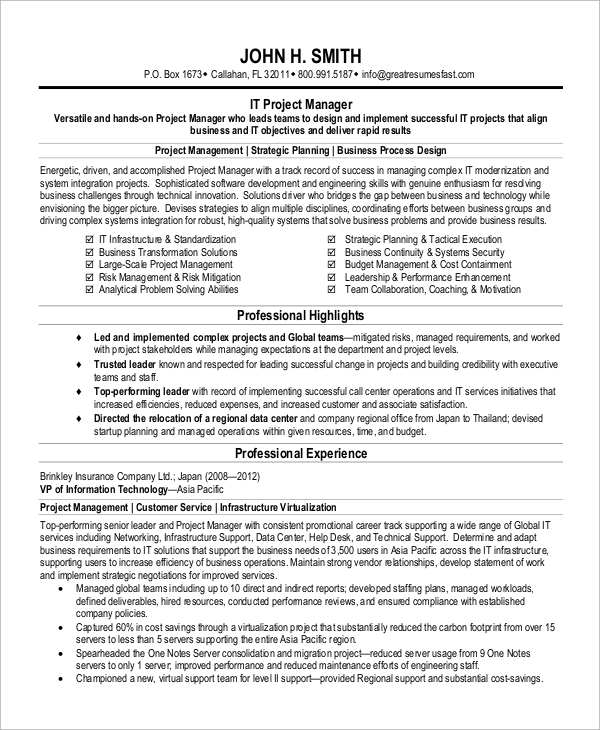 This is a project manager resume sample. It is quite different from the general resume as experience gets the priority here. It starts with the personal profile and academic qualification. It moves on to work experience and explains everything in details. Then it states the skills and competencies, and personal attributes of the candidate. 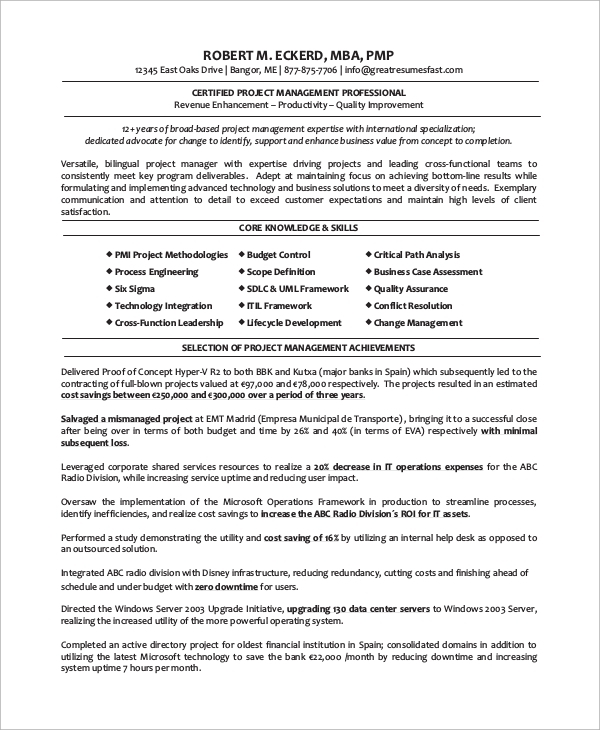 This resume for a construction project manager starts by listing the vital parameters in project management and the roles performed by them. It moves on to personal experience with a detailed list of past work and achievements. It concludes with personal development skills like qualifications, training, and certification. 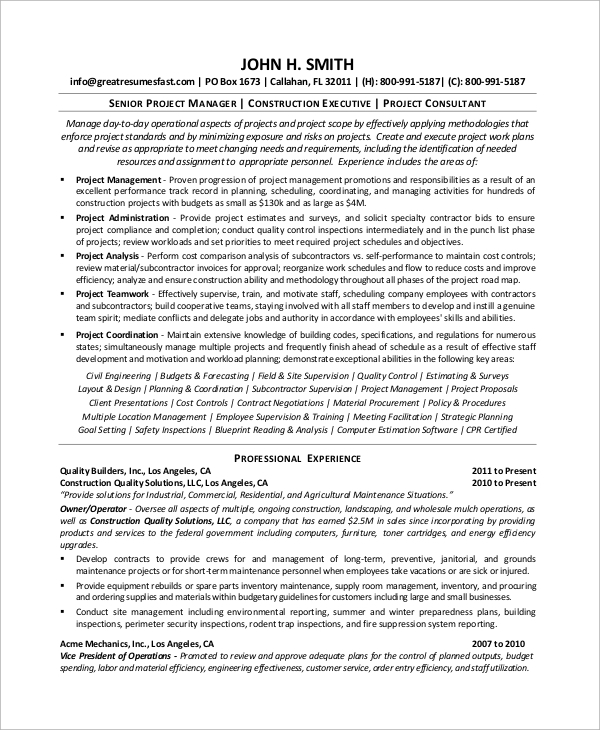 This is a resume for a senior project manager. It begins with a pointwise executive summary and followed by strengths. It lists all the skills relevant to the post and talks in details about experiences, expertise, and knowledge. It lists the past works in chronological order. This is a perfect resume for a technical project manager. It is very clean and well-structured. It contains highlights of project management, professional achievement, professional experiences and a detailed list of past work and roles and responsibilities. 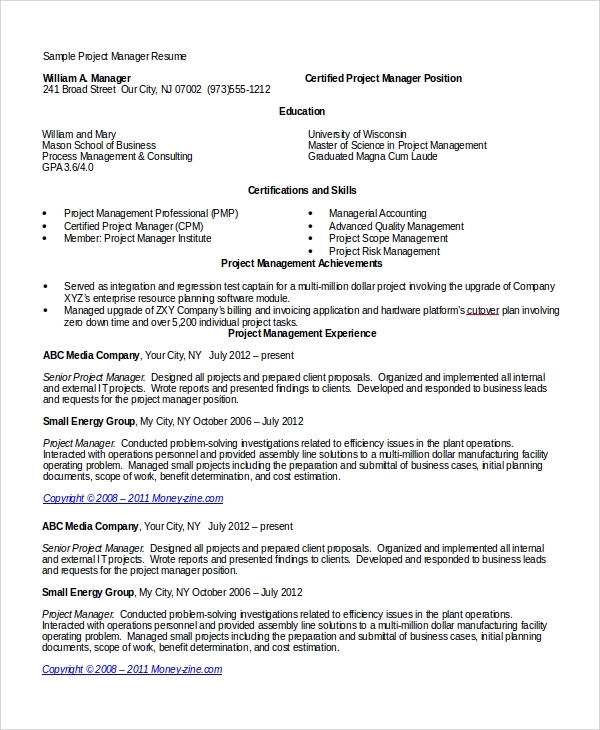 This is a resume for a certified project manager. It begins with the certifications and moves on to executive summary. Then the skills and knowledge get listed in bullet points and in bold. It talks about the achievements of the past and the experienced gathered and describes the professional history of the candidate. It also has provisions for personal development and professional membership. The project managers need to prepare specific and special resumes that will highlight their work experiences more than anything else. For freshers, it has to be the qualifications and the certifications along with past works that should do the magic for them. All the Resume Formats listed above, cater to different categories of manager depending on the companies and positions. 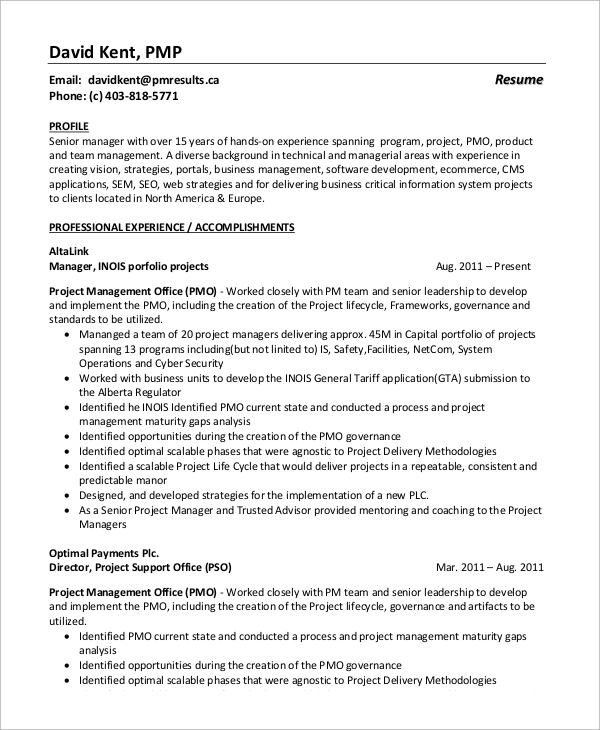 These resumes are professionally created and sure to highlight the project manager brightly. The targeted audiences for the project manager resumes are the project managers of all types. These samples can also be used by the freshers who have done MBA or by those who are working as an assistant project manager or junior project and now want to get promoted to the post of a project manager and senior project manager. It is highly effective for the experienced project managers who want to apply in other companies for a better prospect.You can also see the Basic Resume Samples. 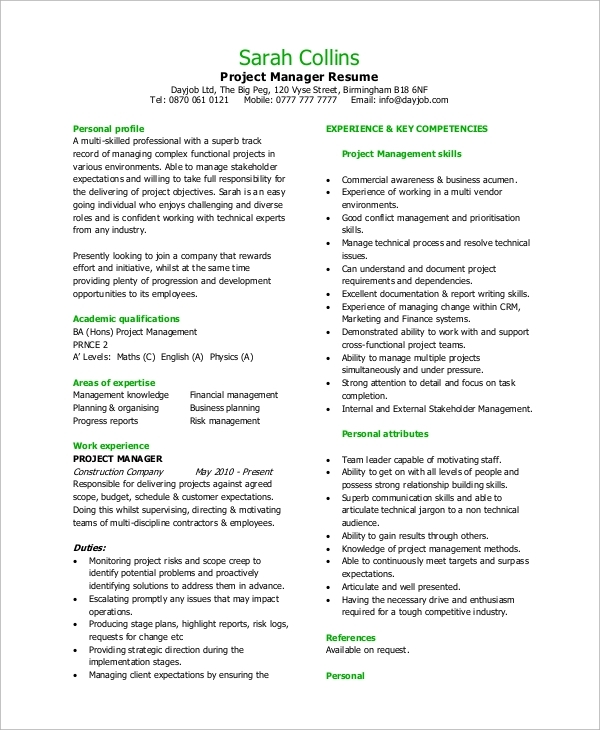 The above-listed project manager resumes contain the perfect format to highlight the required parameters so that the project manager can get the desired job easily. There are different types of resumes listed above such as construction project manager, general project manager, technical project manager, certified project manager, certified project.